For starters, CoinPot Tokens were introduced alongside a lottery game. The premise is simple – you either buy tokens with cryptocurrency or you earn tokens each time you, or one of your referrals, makes a faucet claim then use them to enter the lottery or the new Multiplier game (more about this later). Other uses, such as redeeming them against game credit, are promised for the future. Next came the associated Moon Bitcoin Cash faucet changing domain. This caused a bit of controversy because users felt they weren’t properly notified – on arrival at the old website they were simply told it was dead, with no indication as to where to find the new one. An announcement was made on the CoinPot website under the news section, but for many this was not enough and there was a lot of grumbling in various corners of the web. Now, another week brings another development: CoinPot has launched a Multiplier game which you can spend your tokens on. If you’re familiar with the hi-lo games that are popular in the cryptocurrency community, such as that found on FreeBitcoin, then you’ll instantly recognise the CoinPot offering and understand the rules, which are very simple. 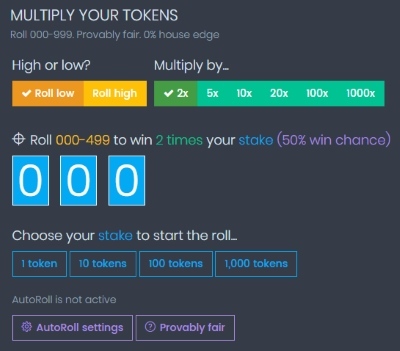 You decide whether you want to roll high or low, choose a multiplier (how many times your stake you’ll get if you win), then select how many tokens you want to gamble with. The higher the multiplier you choose, the less chance of winning you have. If you select the lowest multiplier of 2x then you have a 50% chance of winning; with the highest multiplier of 1000x you have a 0.1% chance of winning. Multiplier rolls are guaranteed to be fair because the seeds for the roll are known beforehand. This number is used as the result of your roll! We have no idea what this means, but we think it sounds good and, well, fair. The other thing to note is that the game has zero house edge which means neither CoinPot or the player has any built in mathematical advantage to winning. What all this means is that CoinPot has given users yet another reason to keep in visiting and hopefully means the service is here to stay. Judging by the amount of chat there is about the microwallet on the major cryptocurrency forums, it certainly seems like it’s a hit with users. If you’re unfamiliar with the world of faucets and microwallets, here’s a very quick lesson: Faucets are websites that pay out tiny amounts of cryptocurrency to incentivise you to keep returning. This in turn boosts their advertising revenue and enables them to pay out more in the future. You’ll find faucets for all the main cryptocurrencies, but the most popular format is bitcoin where the payouts are made in Satoshi – the fractions of a bitcoin (100,000,000 Satoshi = 1 bitcoin). The amount faucets pay varies considerably, although it’s invariably tiny, with payments often referred to as ‘dust’. However, claim often from a selection of good faucets and this dust will soon become a usable amount of coin. To make the process of collecting a significant amount of cryptocurrency together quicker, the payments are made into what is termed a microwallet. Here, all the fractions of coin are added together into one lump sum ready to be transferred to your bitcoin wallet, such as Coinbase. CoinPot is one such microwallet among several others out there. Despite only launching in 2017, it has grown dramatically in popularity because of its easy-to-use format, high-paying connected faucets and extras such as a browser mining facility and instant conversion between coins function. All you need to do to get started is sign up to the faucets using the links above, create a CoinPot account, link it to your bitcoin address then start collecting coins. It’s very simple to do, costs you nothing and earns you completely free cryptocurrency which you can then spend, trade or simply convert into cold hard cash. 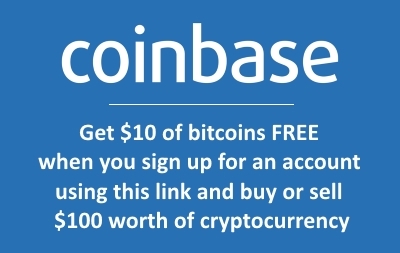 If you need a bitcoin wallet, we recommend Coinbase for ease of use and security. Also, if you sign up using our referral link and buy or sell more than $100 of cryptocurrency you’ll earn $10 in bitcoin, and so will we. Feel free to get in touch with your questions and queries – we’re always happy to help!